There are many wonderful things in the Word of God. 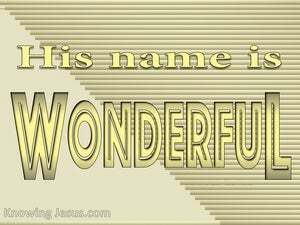 Abraham was reminded that nothing is too wonderful for the Lord and Joshua discovered that God did wonderful things in the midst of His people. Gideon rejoiced in all the wonderful deeds that the Lord had done for their forefathers.. while David lifted up his voice and sang praises to the Lord as he meditated on the wonderful works of God.